Great ready for this flavor explosion of awesome! Over the summer my travels took me all over the US, including the kitchen of my favorite food blogger, Nicole. While playing in her food blogging wonderland of a house, I was inspired to whip up this little Mexican fusion-y dish. 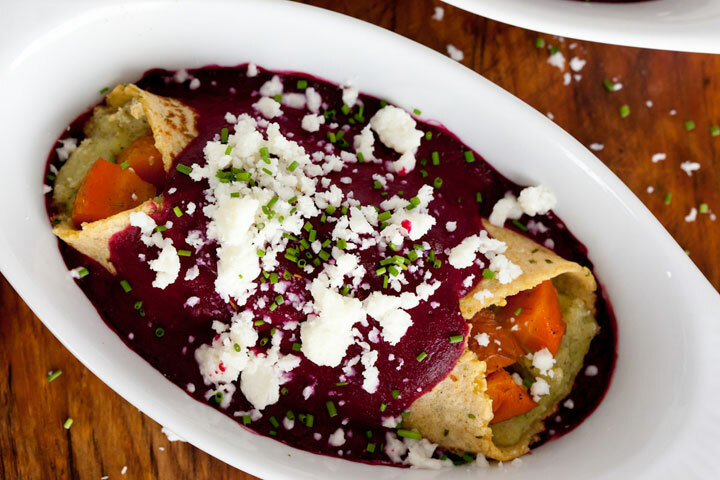 It’s spice roasted carrot and herbed hazelnut chevre filled roasted garlic & chive buttermilk corn tortilla enchiladas with roasted beet, tomatillo and garlic sauce and crumbled queso fresco. Though not at all traditional, these enchiladas were the bomb in their own unique way. Since I procrastinated, oh, 6 months in writing this post, I couldn’t even remember what the heck was in the middle of those delightful tortillas. I posted on Nicole’s facebook asking if she remembered what the innereds were and the super badass chica/fellow-diner from that distant May evening, Ruby, chimed in that her tummy remembered these enchiladas. I’m gonna take that to mean she didn’t think they sucked either. 😉 I hope you guys not only make these tortillas, but go play with the description and recreate the whole dish. Pinky swear you’ll love it too! (Unless you don’t like beets or tomatillos or hazelnuts or chevre or carrots… or awesome.) Buen provecho!